Single row Cylindrical Roller Bearings are designed to support heavy radial loads and are some of the most common bearings used around the world. These roller bearings consist of an Outer Race, Bronze or Steel Cage, a complement of rollers, and usually an Inner Race. They are available in ISO and ABMA series. The ISO series is metric dimensioned, with a brass cage. Bearings designated with the “E” suffix are Extra Capacity. They are re-designs of original geometry that increase radial load capacity. 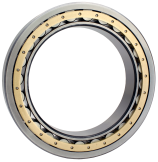 These bearings are designed to be dimensionally interchangeable with the same basic size of other manufacturers and are supplied with C3 internal radial clearance unless specified. The ABMA series are metric or inch dimensioned and interchangeable with other manufacturers as well. They are supplied with a machined brass cage or an alternate cage of machined steel (SM) or stamped steel (SS) when needed. The standard internal radial clearance provided is designed to allow interference fit of inner race while keeping the bearing free mounted. The large assortment of Inner and Outer Race configurations lend to their widespread use in electric motors, gearboxes, and general industry applications. Customizable to meet specific application requirements.